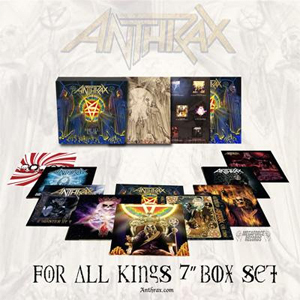 ANTHRAX Stream KANSAS Cover "Carry On Wayward Son"
On March 24th, thrash legends ANTHRAX released their For All Kings Limited Edition 7” Box Set via Megaforce Records. Included in that release is the band’s cover of the KANSAS hit, “Carry On Wayward Son”, which is now available for streaming and you can check it out below. The For All Kings 7” Box Set includes a removable lenticular cover and contains 10 7” vinyl discs featuring 20 songs - the 11 finished album tracks, two brand new covers (THE WHITE STRIPES' "Black Math" and the KANSAS classic), six demos from the FAK track listing, and "Vice Of The People", a bonus track previously released only in Japan and now making its North American vinyl debut. The original album cover art sketch by Alex Ross is also part of this package, as well as a download card enabling the holder to access the Box Set's tracklisting for free. Each 7” disc features gorgeous, double-sided four-color artwork designed by Douglas Heusser with additional art by Stephen Thompson, as well as band photos by Jimmy Hubbard. The tracks are pressed onto different-colored vinyl discs - red, green, blue, maroon, orange, most with a two-color swirl design. "Doing a box set edition of For All Kings was something that we've always wanted to do," said Charlie Benante, who worked closely with Heusser and Thompson on the box set's artwork. "We wanted to do something special, something that was so much more than the original release, and have it be fun for our audience when they open it up, just be floored by the different colored vinyl, the artwork, everything that's inside. And we think we've done that."